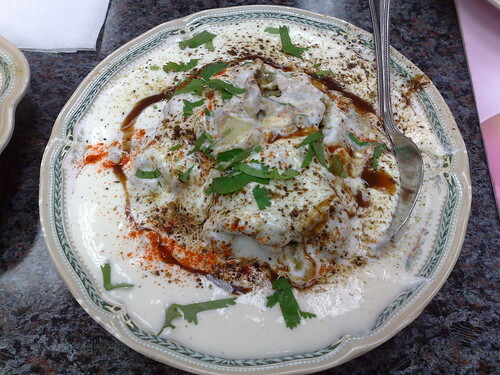 Dahi bhalla also called as Dahi bhalle is a popular street food which is normally counted among "chaat". Dahi Bhalla is often a special food during the Holi festival too. Dahi bhalle is made of dal pakodas and tangy yoghurt and garnished with tangy and sweet chutneys. This can be widely seen in the streets of big and small cities. Dahi Bhalle is wadas dunked in loads of chilled and seasoned curds and then topped with tamarind chutney and spices. Though usually, dahi bhallas are tastier at the roadside vendor's shop, it is not that possible to bring that yummy taste at home but it can be made at par with them by using roasted cummin powder, chat masala, black salt , tamarind chutney and red chilli powder. I have tasted different variation of this. Some like their curds to be sweet, others like it salty. The Gujarati version has a sweet and spicy flavor and uses liberal amounts of curds. The Punjabi version is salty and the wadas are just submerged in the curds but not floating in it. The dahi wada that I've tasted in Udipi cafes has tempered sweet curds. But for a good yummy taste, it is best to mix up and prepare. For the bhalla, clean the black gram and soak in water for 2 hours. Drain and grind to a fine paste, adding very little water. Remove to a mixing bowl and add salt, cumin seeds, ginger, and green chillies. Mix well and shape into even-sized balls. Remove the bhalla from water, squeeze out excess water and add to the yoghurt mixture. Keep aside for 10 - 15 minutes. Preparation time: 20 minutes (excluding soaking time). Cooking time : 30 minutes. Serves : 4 persons. Makes some 8- 12 wadas. Serving suggestion : Serve with chilled dahi and garnishings. Make the batter little thin. But not very watter, just enough to be fluffy. Then pour it into hot oil using a spoon and deep fry it till golden brown. Cooking soda can be added to make the wadas spongy and crispy. Freeze the wadas for sometime for better taste. Use roasted cummin powder for garnishing. Click here to know more about Punjabi Foods and Cuisines - An Introduction To Punjabi Foods And Cuisines.